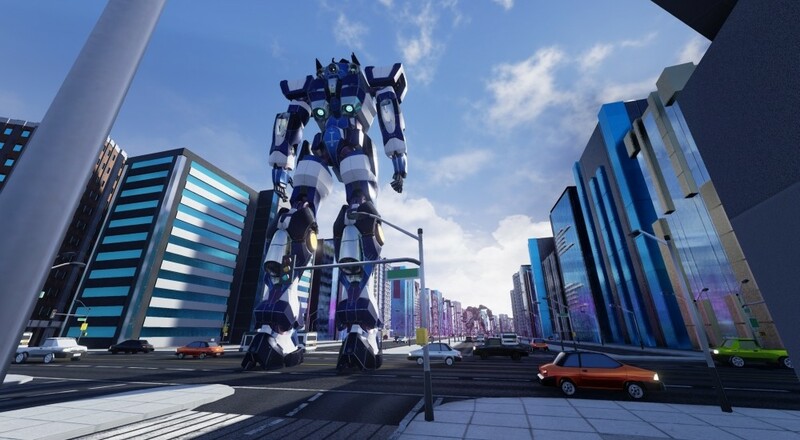 In Override, you pilot a massive robot marching around the city making sure invaders stay away. The catch is instead of pressing left to move left, up to four local players control the four limbs independently. Walking, then, requires at least two people to coordinate their actions, otherwise you're just a big mech flopping on the ground. Missions come your way via Bot Watch, the city's most reliable news source, that informs you of everything that needs to be done. Kitten need rescuing? Watchbot to the rescue. Villain's gigantic insec foe need toppling? Let's go, everyone! In the same way Octodad made fixing a bowl of cereal a complicated task, Override makes saving a city from peril a (fun) ordeal. The Watchbot mech reacts to his surroundings in a very real way, allowing you to grab, toss, break and trip over things in the fully destructible city. Cooperation is obviously key, as nobody's going anywhere unless the entire team is in on the action. Scaling down to solo mode will reduce the complexity, but the developer has promised it'll still be a crazy experience without friends. Override is coming to Windows, Mac and Linux via Steam. The current forecast calls for playable alpha by April 2015, beta in July, and the final release in October. Page created in 0.6126 seconds.